In Iskenderun Bay, mostly bottom trawls are used in shrimp fishery, which is a major activity due to the high value of the resource. Various types of gears commercially employed to capture shrimp include seine and trawl with different modifications (Can et al., 2005). Prominent species in commercial shrimp fishing are Penaeus semisulcatus (de Haan, 1844), Penaeus kerathrurus (Forskål, 1775) and Penaeus japonicus (Bate, 1888). The number of registered trawler is around one hundred in Iskenderun Bay; however, only sixty of them presently carry on trawl fishing. Most of the trawlers, whose number changes with season, mainly target shrimp species. While seventy percent of them employ traditional trawl nets in fishing, ten vessels use imported cutting shape nets and two vessels make use of combined nets, which they have newly designed (as reported by Nihat Beyazit, Iskenderun Local Fisheries Cooperative). Total length and main engine power of the shrimp trawl vessels vary between 16 and 22 m, and 250-350 HP, respectively. There are some modifications in dimension, materials used and design features of the trawl nets in Turkey (Akamca, 1996; Tosunoglu et al., 1996; Demirhan et al., 2005; Tokaç et al., 2005; Demirci, 2006; Doyuk, 2006). This study investigates the designs of shrimp trawl nets and modifications in Iskenderun Bay. Technical plans of the trawl nets were drawn from the original data collected from three of twenty commercial trawlers. The data collecting was made in collaboration with Iskenderun Fishery Cooperative. The drawings were standardized according to FAO Catalogues of Fishing Gear Designs (Nedelec, 1975; Nomura and Yamazaki, 1975; FAO, 1978; Brabant and Nedelec, 1984). Nets of three commercial trawlers were measured on board. They are designated as traditional nets, combined nets and cutting shape nets. Their technical plans are illustrated in the following figures. The size of the trawl is determined by the circumference at the mouth of the belly section as a basic data and compared with other net designs in several steps. 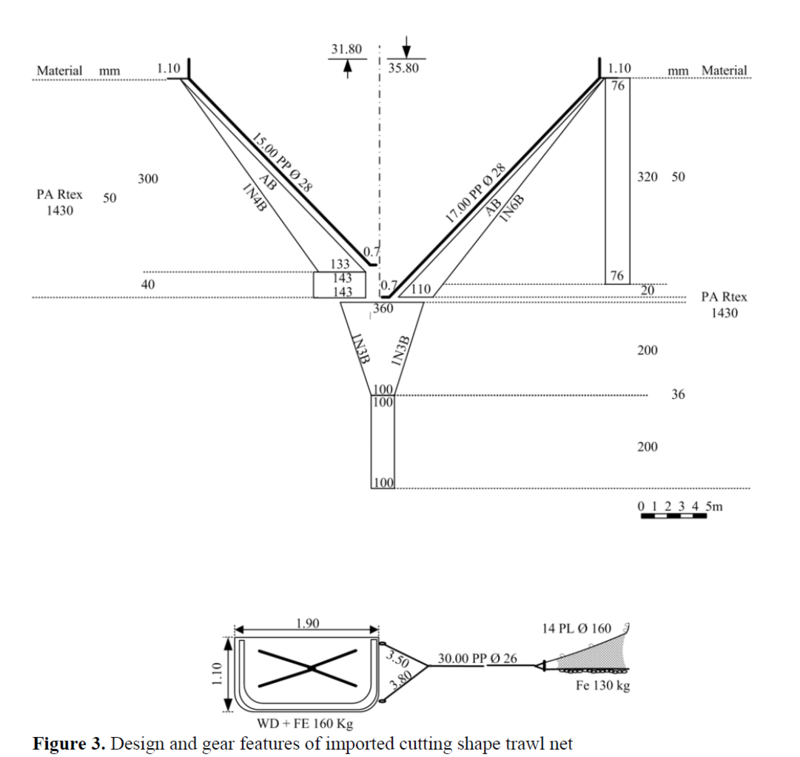 Designs of traditional trawl, combined trawl and cutting trawl nets were given in Figure 1, Figure 2 and Figure 3. 1. All of the nets were made of polyamide (PA) material, however polypropylene (PP) material was used in models and polyethylene (PE) material in wings of traditional nets. 2. The sizes of the circumference of the trawl are determined by the number of meshes and mesh size. The mouth is correlated by the designer with horsepower of the trawler. The procedure was designed for cutting net shape, but Turkish Trawler rigging and equipment, differens from others in the world, were not taken into account. Therefore, these nets (cutting shape) are too big for these trawlers. However, the other two nets were designed by empirical methods by the local fishermen. 3. The wing characteristics of trawl gears are various. In the traditional nets, wings are formed by either increasing or decreasing the number of meshes. In combined nets, wings are formed by mono cutting formula (1N2B). In cutting shape nets, wings are formed by all bar and cutting formula differently in headline (1N4B) and fishingline (1N6B). Additionally, its wings are made of four seems, two of which are called side panels. 4. All of the nets consist of two equal panels. Decreasing number of mesh was accomplished by shrinking in traditional and combined nets whereas by cutting in the third design. The cutting shape panel length was much shorter than the others. The length for the belly sections can also be related to the cutting ratio used, or to the convenient filter action for the target species and with the total netting area because of the towing resistance of the net. 5. The codend mesh size was confirmed as 44 mm in fishery circular for the area (Anonymous, 2006). Codend mesh size of all nets was 44 mm, but the new codend added to original cutting shape was a mesh size of 36 mm. 6. The mesh size of protection bag could be 120 mm and its length is equal or bigger than the codend. 7. When determining the number of floats in the headline, the main problem is to know how much flotation force is required. The minimum flotation force required should balance the footrope weight provided by the experience of the fisherman. It is safer to mention in this respect that chain should be used as counter weight for shrimp trawl nets. Local fishermen, who were used to lead weights, have now turned to using chain fragments. 8. Warps are normally not made use of in shrimp trawl nets, yet warps have to be used on Turkish trawler vessels, because you would not be able to take the nets on board in hauling process with out warps. The modification of commercial fishing gears to make them more efficient is a very delicate matter. Problems of acceptance may occur when a new trawl is introduced in an established fishery (Valdemarsen and Suuronen, 2001). There is a need for further studies to improve the gears used. Both performance and efficiency of these nets improved by the studies in a series of model tests depend on similarity rules in flume tank and field experiments carried out using a full scale net under towing conditions by performance measuring instruments. In conclusion, improvements should be made if required or new designs should be suggested with a view to ensure sustainable fisheries in the Iskenderun Bay. Akamca, E., (1996). Technical and Structural Characteristics of Trawl Nets Used in Iskenderun Bay (in Turkish), MSc. Thesis, Adana: University of Çukurova. Anonymous, (2006). Circular No: 37/1 of 2006-2008 Fishing Year Regulating Commercial Fishing in Seas and Inland Waters (in Turkish), Ankara, 86s. Brabant, J.C., Nedelec, C., (1984). Bottom Trawls for Small-scale Fishing, FAO, Fisheries Technical Paper 189, Rome, 40 pp. Demirci, A., (2006). A Study the North-East Mediterranean Deep See Trawl Fishery, PhD. thesis. Izmir, University of Ege, Pp. 47-50. Demirhan, S.A., Seyhan, K., Engin, S., Mazlum, R.E., (2005). Catch composition of bottom trawl in East Black Sea (in Turkish). In: Düzgünes, E., Okumus, I. and Ögüt, H. (Eds). Turkish Journal of Aquatic Life, 4: 72-76. Doyuk, S.A., 2006. Determination of the Technical Specifications of Fishing Gears Used in Çanakkale Region (in Turkish). MSc. thesis. Çanakkale: Onsekiz Mart University. Pp 24-26. FAO, (1978). FAO Catalogue of Fishing Gear Designs, Fishing News Books Ltd., Farnham, Surrey, England, 160 pp. Kaykaç, M.H., Tosunoglu, Z., Tokaç, A., (2005). 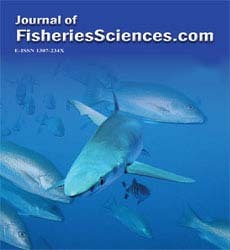 1/10 scale model net experiment of 600 meshes conventional bottom trawl net (in Turkish), Ege University Journal of Fisheries and Aquatic Sciences, 22: 337-341. Nedelec, C., (1975). FAO Catalogue of Small- Scale Fishing Gear, Fishing News (Books) Ltd., Surrey, England, 191 pp. Nomura, M., Yamazaki, T., (1975). Fishing Techniques, Japan International Cooperation Agency, Tokyo, pp 39-125. Tokaç, A., Tosunoglu, Z. Gökçe, G. Kaykaç, H., Özbilgin, H., (2006). 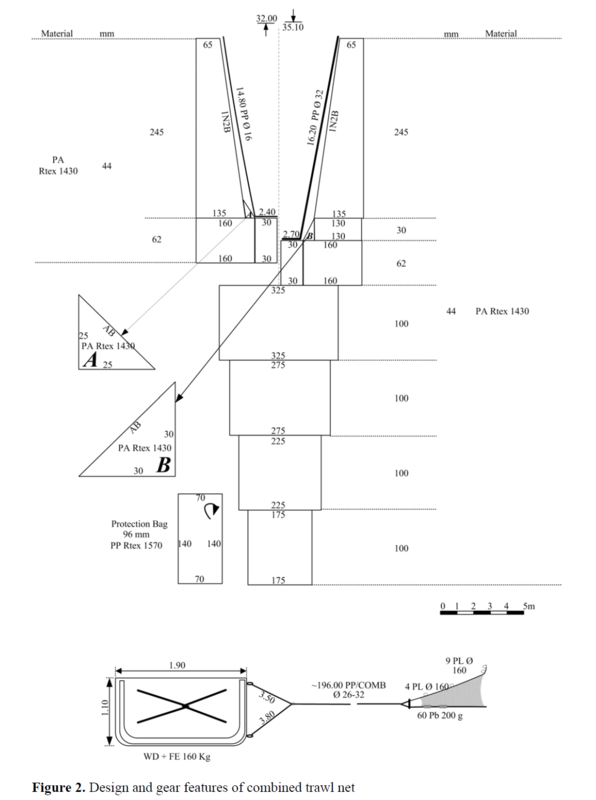 Technical drawing and specifications of 900 mesh traditional bottom trawl net in Turkish demersal fisheries (in Turkish), Ege University Journal of Fisheries and Aquatic Sciences, 22: 439-442. Tosunoglu, Z., Kaykaç, M., Aydin, C., Tokaç, A., (1996). Bottom trawl nets used in fishery researches of Ege University, Faculty of Fisheries (in Turkish), Ege University Journal of Fisheries and Aquatic Sciences, 13: 485-498. Valdemarsen, J. W., Suuronen P., (2001). Modifying fishing gear to achieve ecosystem objectives. Reykjavik conference on responsible fisheries in the marine ecosystem, Reykjavik Fisheries Technical Paper, No. 19.